I want to introduce a great saint, a philosopher and a revolutionary who had such great insight and experiences with gods revealing to himself in his mind. The vedic philosophers viewed mind and brain as two different things. They were dualist's and their world view is completely different from the world view held by the current scientific community. It is very illogical to merge science with metaphysical things. Science is about building testable models of the physical world where as spiritual experiences deals with unpredictable identical experiences following a set of procedure by individual persons. Spiritual experiences doesn't fall in the boundary of metaphysical entities. Metaphysics is something which can not be falsifiable where as spiritual experiences are unpredictable but they can be falsified through repeating the procedures of the experienced persons. They view the mind as a tightly held rope with the five senses attached to one end and the intelligence or buddhi attached at the other end. They don't see intelligence as something associated with the brain instead they see it as physical entities existing in their own realm like platonic values. This model is based upon the individual experiences of persons who have observed the mind. If one has to have spiritual experiences then they have to detach the connection between the mind and the sense organs. Now the mind appears as a fallen rope and only then we can experience the noumenal world otherwise we'll be seeing the phenomenal world as we see through our eyes. This is the reason why such people abstain themselves from worldly pleasures. It is normally believed that the more pleasure you give to your sense organs more is the strength of the connection between the mind and the sense organs so in order to gain knowledge about the noumenal world through experiences one has to refrain himself from desiring worldly pleasures. Their world view is different they will worship the fire and the sun. They don't see the sun as something which is just shining in the sky. They see it as a god wearing lots of ornaments, pearls and stones throughout the body and the light will be emanating from the blue and red pearls with such intensity that it is not possible for one to see the exact form of it. One can describe the sun god with such precision from their experiences and it is not something which can be reproducible or comprehended through the world of sense organs. The main belief is that the Sun god is the one who is residing in each and everyone behind the mind stimulating our intellect to do noble work. The belief that god is in each and everyone. The foundation of vedic knowledge. 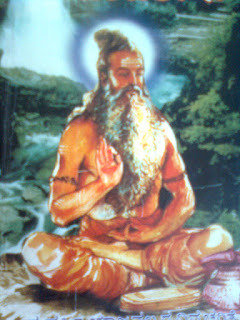 Yagnavalkya maharishi is one of the holiest, purest and highly respected person for his great insight and the height of knowledge that he possessed and who had truly witnessed the sun god. He meditated on his name for one year and lived just by having a glass of milk. When the Sun god revealed to him and asked what he truly wants he said "My lord give what this world truly wants". He didn't asked anything for himself that was the greatness of that man. He wrote two Upanishads one describing the sun god and the other describing the story of himself. He also wrote Yagnavalkya Smrithi which is now the basis for all Hindu traditions and practices from marriage, naming ceremony to cremation. The thing which I most admire about him and his life is that he was very humble and led a simple life and achieved such heights in having deep insight and knowledge and no one had such pure experiences like he did in his time and no one can reach such heights like he has. Hearing about the greatness of this man the king Janaka said "this man knows everything, a true sarvagnya and he acts so humble and we people if we just know a little we jump and act like we know everything , can we place a price for this man's knowledge" . Sarvagnya means a person who knows everything. The interesting thing is that these people has the ability to see the future but they are not interested in knowing what will happen. The future has already happened there is no point in saying that we have to build our future. One more great person Vashista maharishi took the sorrow upon himself to save the world from disaster during his time. We are believed to be in exactly the same time i.e the final first stage of this yuga. The coming years will be very exciting. The king Janaka wanted to have knowledge of the infinite so he held an event to test and figure out the person with the true correct knowledge of the infinite. The event was organized in which individual persons share their experiences by asking questions to the one claiming to know the infinite. He said who ever wins the event will get thousand cows with gold rings placed on the horns of each cow. The event begins and the king says who ever wants the price can claim it by answering all the questions asked by the fellow persons, no one says anything the hall enters a period of total silence. The king repeats it again and seeing that no one has uttered a word Yagnavalkya politely stands up and says to his student "take the cows with gold rings to our ashram". The other fellow persons and the whole hall was shocked to hear this and they asked "Yagnavalkya, do you understand what you have said, you have rejected all of us and claimed yourself as the true know er of infinite". Yagnavalkya answers politely to all their questions and the king crowns him. Such was the confidence and greatness of this man. Yagnavalkya finally went and resided in the forest giving all his wealth to his wife. He has marked his presence in the history of mankind and he will be remembered forever and for the centuries to come.